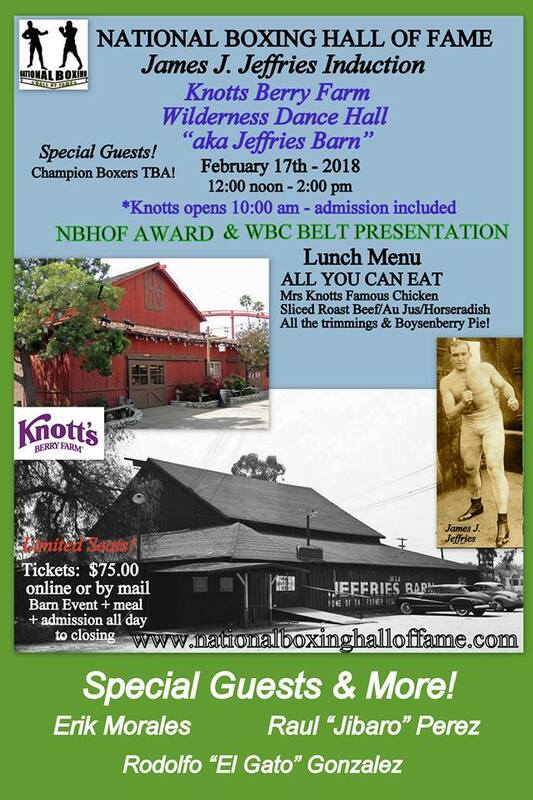 The National Boxing Hall Of Fame is kicking off 2018 with a special induction for James J. Jeffries at the World Famous Knott’s Berry Farm Theme Park in Southern California on Saturday, February 17, 2018 from 12:00pm – 2:00pm. The World Boxing Council will also be presenting a special belt to Knott’s Berry Farm, Wilderness Dance Hall (foremerly known as Jeffries Barn). After Jeffries retired from Boxing, he became a Boxing promoter and held may fights at “Jeffries Barn” which was a structure in his Alfafa Ranch, now known as Knott’s Berry Farm. The National Boxing Hall Of Fame is honored to invite all the Boxing community to be part of this grandious event, celebrating Early Boxing and Hall Of Famer, James J. Jeffries. Special guests include, soon to be inducted, Hall Of Famer Erik Morales, Former WBC Bantamweight Champion Raul “Jibaro” Perez, Former WBC Champion Rodolfo “El Gato” Gonzalez among many more Champions from our local comunity. Tickets cost $75.00 which include stay at Knott’s Berry Farm ALL DAY from 10:00am – closing, Lunch Menu – ALL YOU CAN EAT and of course the special induction for James J. Jeffries from 12:00pm – 2:00pm.